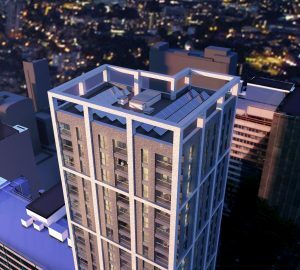 Our design for a 26-storey residential building on Wellesley Road in the heart of Croydon’s tall buildings district was given the greenlight by LB Croydon’s planners last week. Cambridge House is a scheme for Notting Hill Genesis, which will provide 92 one, two and three bedroom apartments of which 45% of the habitable rooms are affordable tenure. 80% of the homes are dual or triple-aspect, with all apartments benefiting from winter gardens allowing them to fully open up or enclose their private amenity space. A striking appearance to the building has been achieved through careful consideration of the surrounding context and materials used, a white brick frame is the primary element of the façade which extends above parapet level to form a projecting crown to the building. Grey brick panels of varying shades sit within this frame to add texture to this deeper layer, and white reconstituted stone columns at ground level. A new shared surface and pedestrian focused public space is proposed around the building, with a new, centralised avenue of trees and tranquil seating area allowing for the extension of the tram stop adjacent to the site.